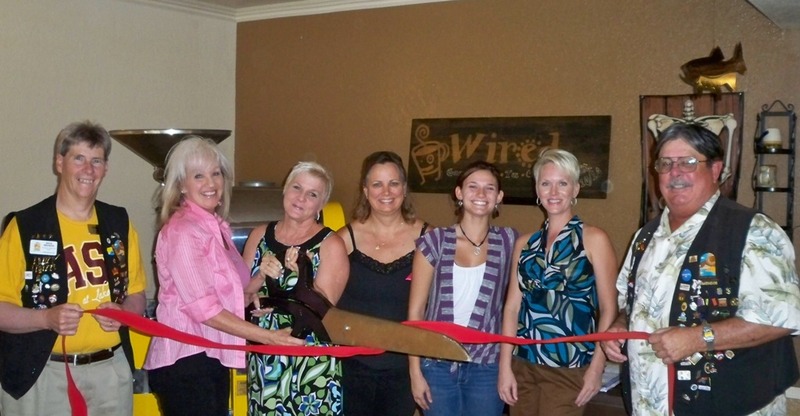 Wired Gourmet Coffee celebrated its 1st year anniversary in business and with the Chamber. Hours of operation are Monday through Friday from 5:30 a.m. to 5:30 p.m. and Saturdays and Sundays from 6:00 a.m. to 12:00 p.m. Wired Gourmet Coffee serves a variety of coffee as well as breakfast and soups and sandwiches for its lunch menu. On hand for the ribbon cutting from left to right are; Chamber Ambassador, Rick Broker, Donna Brister, Eileen Nexsen, Kris Weimer, Carolyn Shannon, Jordan Feist and Mike Schuler, Chamber Ambassador. For more information contact 846-4702 or visit the restaurant at 2131 McCulloch Boulevard.